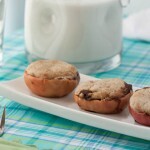 Gluten free and vegan inside out miniature apple “pies” made on the barbecue are a perfect addition to any outdoor evening. To make crust: Pulse flours, sugar, and salt in a food processor to combine. Add earth balance, and process until mixture resembles coarse meal, about 10 seconds. With machine running, add ice water in a slow, steady stream through the feed tube until dough just holds together (no longer than 30 seconds). Remove dough and wrap in plastic. Refrigerate for at least 1 hour (or up to 2 days). Preheat indoor grill. Oven to 375F or barbecue. Preparing apples: Cut apples in half. Placing the half apple slice cut side up, cut a square into the apple and begin to scoop out filling with a spoon. You’ll want to remove about 1.5 tablespoon of apple flesh.Combine earth balance, cinnamon, sugar, and maple syrup in a small bowl. Spread the mixture inside each halved apple. 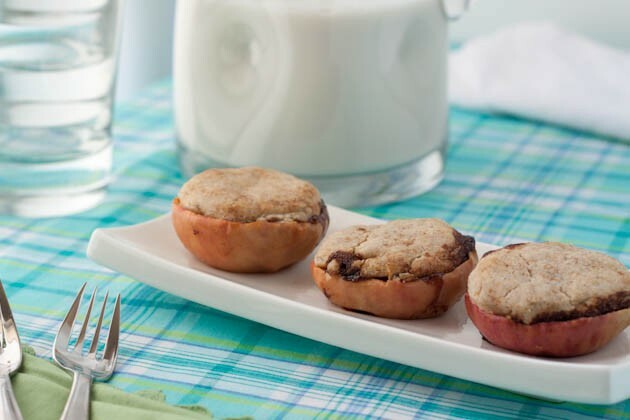 Putting it all together: Remove crust from the freezer and break off about 2 tablespoon of dough at a time, rolling it into a ball and squishing into the tops of the apples. Repeat with each apple. Oven method: Place apples on a parchment paper lined baking sheet and bake for 25-30 minutes or until tops are golden brown.